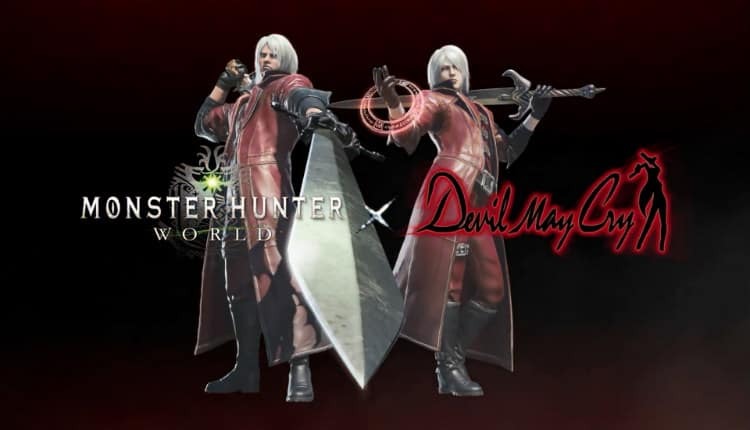 Monster Hunter: World Getting Devil May Cry Cross-Promotion | Nerd Much? Brand unity strikes again! Capcom has announced that Monster Hunter: World will be getting new items as part of a cross-promotion with the Devil May Cry series. The event is spurred by today’s release of the Devil May Cry HD Collection. The iconic classics are being rereleased on PC, PlayStation 4 and Xbox One for $29.99. The Collection consists of Devil May Cry, Devil May Cry 2 and Devil May Cry 3: Special Edition. The devious combination amounts to a Charge Blade weapon in the game. Typically these come with hefty shields, which can be combined with their matching swords to create a massive axe to wield. But the Devil May Cry combo is switching things up. The matching shield doesn’t exists in the Devil May Cry pairing. So instead of your sword turning into an axe, players can unlock a Force Edge that can be converted into a massive Alastor. Quite the inspired touch. And in addition to the new items, there will also be a full Dante costume to adorn your character with. Capcom hasn’t announced when the Devil May Cry cross-promotion items will hit. They have suggested it will be free for all players though. You’ll just have to complete a specific Event Quest to unlock the items when the time comes. Monster Hunter: World is riding a wave of momentum still following its January release. The title shipped over five million copies in its first week. And Capcom has since gone on to state that the game is the best selling title they’ve ever had. And while some may be skeptical of such a statement, it’s still a testament to just how well this brand new entry in the series is performing. You can pick-up Monster Hunter: World on Amazon or at Gamestop.